MainAll NewsInside Israel20th Knesset Sworn In; Bibi's Most Hawkish Gov't? 20th Knesset Sworn In; Bibi's Most Hawkish Gov't? Analysis: The next coalition will face an existential threat from Day One. Is it tough enough to 'go rogue' on Iran? Israel's 20th Knesset will be sworn in Tuesday, hours before the self-imposed deadline in the negotiations between the so-called P5+1 powers and Iran over the latter's nuclear weapons program. While coalition talks for the formation of a new government are ongoing and their outcome uncertain, Prime Minister Binyamin Netanyahu is currently expected to enjoy a 67-seat majority, with the support of The Jewish Home, Kulanu, Shas, United Torah Judaism (UTJ) and Yisrael Beytenu. Netanyahu called the latest election midway into his third term as prime minister, largely because of attempts by coalition members Hatnua and Yesh Atid to topple the government, and a bill that tried to stifle Yisrael Hayom, a newspaper that supports Netanyahu. He asked voters to give him a more stable coalition, and voters appear to have complied. The new coalition – if it shapes up the way it currently seems to be going – will not include Hatnua or Yesh Atid, and if Yesh Atid does enter it, it will have far less leverage than it did before. The party dropped from 19 to 11 MKs, and will not be the kingmaker it was in the previous Knesset. Should the government indeed be formed of the parties mentioned above, it will be the first Netanyahu government with no representation for overtly leftist parties. Kulanu is led by Moshe Kahlon, a former popular Likud minister, and is widely seen as having splintered off from Likud. While he said, during the campaign, that he would support territorial concessions in return for peace if the circumstances were right, his voter base is largely right-of-center. Yisrael Beytenu, the Jewish Home and the haredi parties are known quantities, more or less. Will this makeup make the government more hawkish on matters of defense, though? And what about Iran? Israel under Netanyahu came closest to mounting an attack on Iran's nuclear weapons sites in 2012, when the defense minister was Ehud Barak, former head of the Labor party. Under Barak, the IDF reportedly made detailed preparations for a strike on Iran, but these failed to materialize, at least partly due to the objections of then-head of Mossad, Mair Dagan, and then-Chief of Staff, Lt. Gen Gabi Ashkenazi, who thought the mission was ill-conceived. Since then, Iran has made its nuclear program more difficult to attack. And yet, voices from the United States are urging Israel to go it alone. If it has to, will Israel under Netanyahu “go rogue”? Will the government afford its leader enough stability to make such a bold move? Will the new chief of staff, Lt. Gen. Gadi Eizenkot, be more amenable to cooperation with an Iran strike than Ashkenazi was? 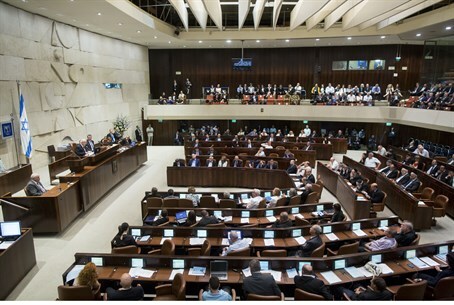 These fateful questions hang in the balance as the new MKs enter the hall of legislature.